In January I received €140,32 in dividend payments. Previous year in January I received €42,43 so my dividend income is up 231%. 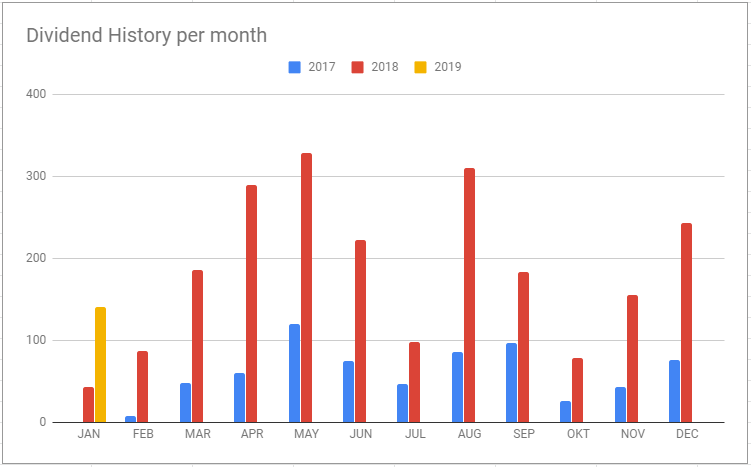 The first month of the year is never a big dividend income month for me. Actually normally January is the lowest dividend income month for me, but this year probably February will be the lowest month, because I expect €123,86 next month. This month I received payments from 7 companies. Dividend payments from Wereldhave, Altria and Coresite Realty are responsible for over 50% of my income this month. congrats on a solid month and great yr over yr growth. That 50% dividend increase aint bad either!